And because she's a darned cute kitten. She's so adorable. When my grey cat, Cloud, was little she'd chase the things on my computer screen. Fortunately she was cute enough I didn't feel like tossing her. Sometimes she'll still chase things on the screen, but I think she's figure out she can't catch them. There was a chunk of time in the game where Boro was down to 10 men... only they still had 11, didn't they, 'cause Zin was helping out! Does she actually have her paw on the ball? That's great. Erm... I think she has her paw on one of the players. She was just trying to help out my team by taking down those nasty Arsenal boys! Off topic, I was told to get you or Don my e-mail for a community. Here it be. Woohooo! I've passed it on to my sweetie, who really is the grand high poobah of the NYRF board. Can't wait to see you there! I'm just not used to hangin' with the cool kids, though. No wedgies, okay? I've seen you fight. No worries, mate. Yes, yes you can. 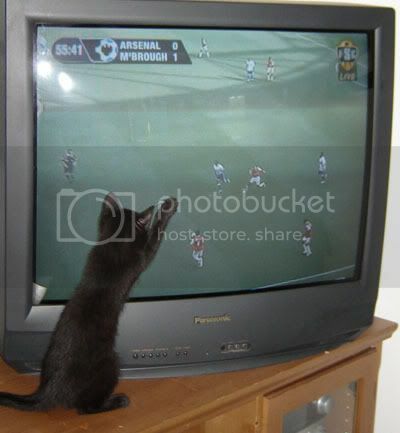 And I think our kittie might have a future in the Premiership league.